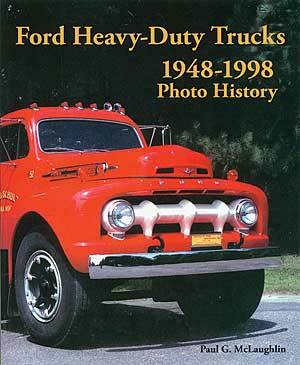 Ford Heavy-Duty Trucks 1948-1998 by Paul G. McLaughln is a sister book to the Ford Medium Duty Trucks (reviewed in the Autumn issue). Similar in size and scope, this book focuses on the 2½ and 3 ton F-7 and F-8. Though the book is about heavy-duty trucks, there is still a fair amount of information about the F-5 and F-6 trucks, as well as the T Series, N Series, H Series, W Series, Louisville Line, C Series and COEs. And, though black and white, there are simply a LOT of great photos of old Ford work trucks set up in all types of configurations. The author is highly knowledgeable and enthusiastic about these rigs. Trucks are listed in chronological order, so this book could be picked up and read from beginning to end or by a particular group of years. It is an excellent companion to the Ford Medium-Duty Trucks. New from the N-News, $34.95.